It appears as if the Congress party has issued a diktat to its leaders to spew venom against the India and its Prime Minister on foreign soil. Recent events suggest so; Salman Khurshid and Mani Shankar Aiyar lauded Pakistan’s Prime Minister and wanted the democratically elected government of India to be “removed“, while Jairam Ramesh called India a “regressive, moralistic and argumentative country” right in the middle of the historic COP21 in Paris. It is highly hypocritical that the party, on one hand, feels that “PM Modi is embarrassing India abroad” but on the other hand, they leave no stone unturned to demonize our country on foreign soil. The latest addition to this growing list of ‘intolerant’ Congress leaders is Mr. Shashi ‘cattle class’ Tharoor. The suave speaker, who was recently hailed as a ‘hero’ for his stirring speech at Oxford on Britain owing reparations to India, has now gone to the same Britain to tell how India was totally messed up. In a video op-ed for The Guardian with the headline “Narendra Modi’s war on pluralism is destroying India’s reputation”, Mr. Tharoor talks about the “growing intolerance” in India. Earlier, the video was titled “Narendra Modi’s war on Muslims”, and Mr. Tharoor didn’t take a public stance against this irresponsible fear mongering by the British publication. Perhaps that suited the party’s agenda? The headline was changed only after many people on social media called it despicable. The problem doesn’t end with the title. In the video, Tharoor starts by talking about the infamous Dadri lynching and murders of rationalists – something that has been repeated by everyone. These incidents should definitely be condemned strongly and the perpetrators should be punished as per the law. For me, these are at fault – the state governments for not handling the law and order efficiently, the opposition for politicizing the death, and also the BJP for not controlling their leaders from making controversial remarks. For Tharoor, only Modi is at fault. Isn’t it irresponsible, if not immoral, to use only one set of such incidents to paint a terrible picture of your own country to the world with no data to back your sweeping claims? Not only irresponsible, it is naive to hold PM Modi responsible for such an incident and dubbing it as “a war on pluralism”. PM had condemned the incident, opposing pseudo-secularism and the politics of polarization. And recent reports have also suggested that the Dadri killing was a personal grudge, dubbed as communal killing. But Shashi Tharoor conveniently ignores all these aspects to peddle his agenda. 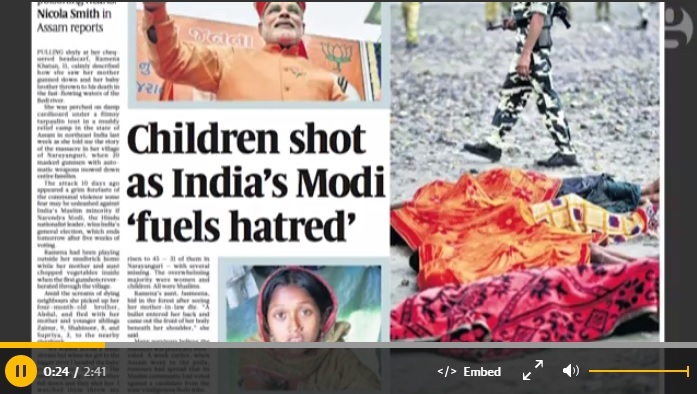 The video next shows a newspaper clipping (see pic below) titled “Children shot as India’s Modi ‘fuels hatred’”. This was taken from an article from The Sunday Times (UK) on Bodo-Muslim conflict, which was published on May 11th 2014, long before Narendra Modi took charge as the PM of India! These killings are a result of a decade-long Bodo-Muslim conflict which many presume to be a result of various factors like illegal immigration, internal conflicts between Bodos and the Assam’s Congress government etc. It is extremely malicious to hold Modi responsible internal politics of a Congress-ruled state. Facts conveniently ignored again. Mr. Tharoor, ignoring facts could be good politics but ignoring the conflict is not. Why don’t you help Assam CM Tarun Gogoi, who belongs to your own party, solve this conflict in the state of Assam? Record one video and send that to him. Coming back to the video, Mr. Tharoor goes on to say, rather grimly, that there is a growing impression India is being ruled by “obtrusive and intolerant” forces. This is an extremely ironic statement to make considering the ‘obtrusive and intolerant’ manner in which the Congress party is stalling the winter session of the parliament over mundane issues. He can record yet another video on being ‘constructive and tolerant’ to his own party before he waxes eloquence on the ruling party. Tharoor then gleefully talks about the Beef ban in India and how it is denting the prevailing national culture of our country. He says beef banning hysteria is being spread by Hindutva forces, conveniently forgetting, yet again, that it was the Congress government which was the first to impose the ban in many states. I will not talk about the reality behind Beef ban in India, as it has been widely written about such as this article on OpIndia.com. By equating beef ban with Hindutva, is Tharoor arguing that Congress is also a ‘Hindutva force’? Tharoor also seemed to be very concerned about India’s cultural image in the eyes of 50 African ‘beef-eating’ Heads of States who attended the India-Africa Forum Summit (IAFS). This summit was dubbed as the ‘biggest diplomatic outreach’ with bilateral talks on strengthening security, boosting trade, steps towards poverty alleviation, disease eradication etc. I would like to ask Mr. Tharoor a very simple question, did these African HoS come to India to have beef? Do you really think their concern would have been the menu of the summit or the progress of the bilateral talks? Stop thinking on behalf of others Mr. Tharoor. You have appointed yourself the spokesperson of the minorities in India, but let the African Heads of States speak for themselves. And before that, let ordinary Indians speak for themselves. Editorials, Award returnees, intellectuals and opinion makers ARE NOT the voice of the nation Mr.Tharoor. People of India who vote are the voice of the nation. Indian diplomats are merely being asked, by the ruling party, to do their jobs, wonder what made you think they are ‘tearing out their heads’, any evidence for that? And these are only a few things you have messed up in your video. People might accuse me of indulging in “whataboutery” for talking about things that happened when Congress was in power, but Tharoor has to be asked this. Will he be fine if a video is made titled “Indira Gandhi’s war on Sikhs destroyed India’s pluralism” about 1984 anti-Sikh genocide? Or the ethnic cleansing and displacement of Kashmiri Pandits, a community to which his late wife belonged to (I will not get personal by writing about the manner in which his wife was murdered, a lot has been written about it). Then there is the Bhagalpur, Muzaffarpur riots, the list is long. Can Tharoor confirm which parts or people of India was “at war” then? Truth is – it is that Congress that is at war with India’s democratically elected government, and Tharoor is just following the age old wisdom that “everything is fair in love and war”. How else can you be curiously oblivious to the damage the manufactured outrage of ‘intolerance in India’ is inflicting on the global perceptions? Yes, there is a war, and it is a war declared by Congress, where half truths, misrepresentations, and blatant lies are the weapons. Mr. Tharoor, it’s your propaganda that is destroying India’s reputation, not any imagined war.